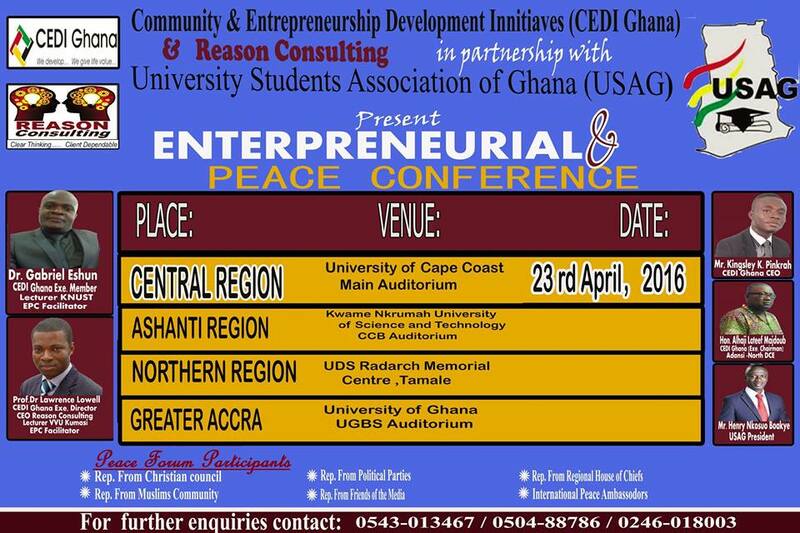 Community and Entrepreneurial Development Initiative (CEDI Ghana) is a private development company in Ghana. The company is a group of university lecturers and government officials who have come together to promote national development. We research into social problems and provide the government with remedial goals in solving national problem. Development areas we promote include skills and capacity building, fighting against poverty and unemployment, maintaining peace and security, promoting human rights, fostering social and economic development, protecting the environment and providing humanitarian aid in cases of famine, natural disaster and armed conflict. CEDI Ghana was incorporated on 11th day of February 2015 under the Companies Act, 1963 (Act 179) as a private development company by Mr. Pinkrah Kwaku Kingsley, Prof. Dr. Lawrence Lowell (Lecturer), Dr. Gabriel Eshun (Lecturer), Honourable Alhaji Lateef Majdoub (District Chief Executive) and Honourable Kingsley Atta Boafo (Parliamentarian) having complied with the provisions of Section 27 and 28 of the Companies Act, 1963, Act 179 entitled to commence business from February 17th, 2015. Ever since its commencement, the organisation has run several national projects and solve a lot of national issues which some includes; National Entrepreneurship Conference which provided thousands of unemployed and fresh graduates, entrepreneurs, students and service personnel entrepreneurship training, mentorship, networking, funding from investors and donors and a job placement from recruitment agencies. It was in partnership with Government of Ghana, British High Commission and the United Nations Development Programme. Community and Entrepreneurial Development Initiative mission is to promote national development. That is to positively impact the life of people. Our vision is to fight against poverty and reduce inequality. Financial plan: Our main source of funds is grants from government, donations and contribution from members. Core Plans: CEDI Ghana plan of growing international. Although CEDI Ghana is a national level organisation, we believe in growth in Sub-Sahara Africa and it beyond. In other words, CEDI Ghana seeks to replicate it effort across other African countries and beyond and below are the plans to achieve this; * Building networks and sharing learning: CEDI Ghana plan of collaborating with other organisations around the world to help leverage expertise among social enterprises in Ghana towards achieving sustainable millennium goals and this summit will complement this effort superbly. * Partnership: Because there are other organisations around the world and locally on issues of community development and entrepreneurship, the onus is on CEDI Ghana to seek for strategic partnership towards actualising its objectives. This platform will help me seek this partnership. * Support: Organisations such as CEDI with it novel approach of community development and entrepreneurship demands financial support. CEDI Ghana has maintain a non-partisan approach to seek governmental assistance with the ministry such as ministry of local government, ministry of employment and ministry of finance. We also plan of receiving support from the international organisations too. Mr. Pinkrah Kwaku Kingsley is the Founding President and Chief Executive Officer for Community and Entrepreneurial Development Initiative (CEDI Ghana); a private development company in Ghana and was the Project Manager for Centre for Tourism Research, Kumasi. I hold Bachelor of Science in Agribusiness Management from Kwame Nkrumah University of Science and Technology (KNUST) and am academically and professionally trained in Business and Entrepreneurship, Public Management and Civic Leadership with professional recognition and membership from accredited professional bodies all over the world. Membership includes Global Shapers Community Kumasi Hub, Young African Leadership Initiative (YALI) and alumni of African Aurora Business Network (AABN) and Student in Free Enterprise (SIFE). I am currently on Association of Chartered Certified Accountant to become Chartered Accountant. Mr. Pinkrah provides vulnerable unemployed Ghanaians with entrepreneurship skills and investment opportunities to start something on their own. I assist government with social research to help in it development policies and strategies. 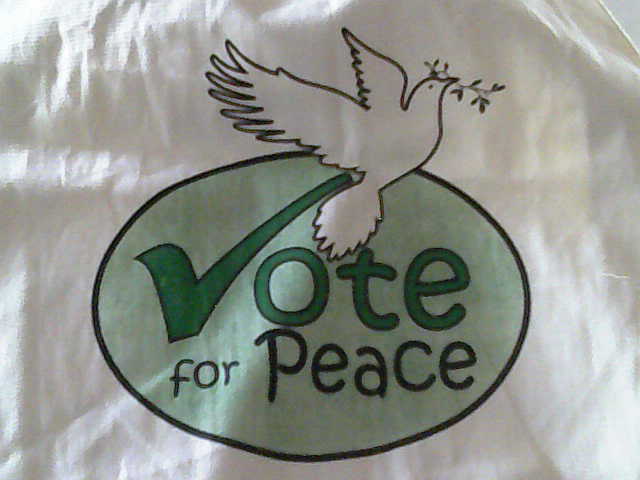 Development areas he promote include skills and capacity building, fighting against poverty and unemployment, maintaining peace and security, promoting human rights, fostering social and economic development, protecting the environment and providing humanitarian aid in cases of famine, natural disaster and armed conflict. I am a public speaker who discusses development issues both on television and radio, a community advocate and a social entrepreneur. I sit with university lecturers and government officials to discuss issues of national concern. I have a lot of publications in my credit too.